I had a great idea, on the GTTSR last summer, which came upon me as we descended from the Lost Trail Pass & Chief Joseph Pass areas on Montana Highway 43 towards the Big Hole. I’d park the Jaguar on a wide spot, then capture the rally cars as they came by, with the static E-type framing the left side of the photo, and an in-motion slightly blurred other vintage car framing the right side. Mark & I were at the front of the pack, so if I was patient, I’d have a chance to shoot a couple dozen cars. If I was lucky, I’d get a good shot of maybe six of them. If I was really lucky, I’d get a hero shot of one or two. I found a spot, with a semi-dramatic backdrop, but not too busy for the (hopefully) very dramatic foreground. The light was right, even the clouds were interesting. I set up my camera way down low to get a nice perspective, and tuned my ear for the sounds of internal combustion. Sure enough, car after car came roaring by and I dutifully held the (set on auto-drive!) shutter down at the moments I deemed appropriate. What I got was mountains of crap. Either cars too far away, or examples like this one, with a slice of car in-frame as it passed. NOT ONE image with a car balanced in-frame with the E-type. I noted this in the long pauses between waves of cars and adjusted my position (thinking the camera was getting too much road in the foreground and screwing up the auto-focus. I turned off auto-focus (not really needed with my big wide angle lens anyway. 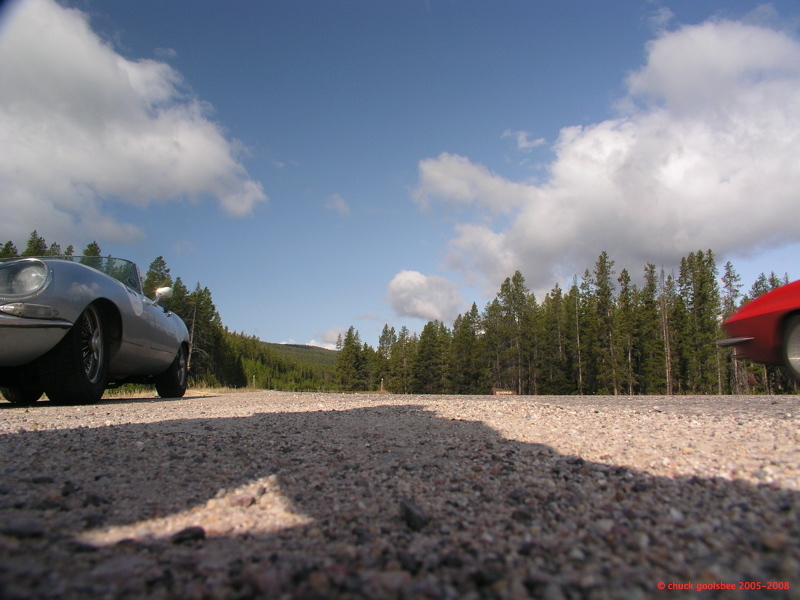 I adjusted my auto-drive shutter intervals… no dice. Piles and piles of crappy photos. Photography is an art form because it involves composition, light, and if you do it right, some forethought and planning. But as Field Marshall von Motlke so famously said “your plannink ist vucked” or something like that. Sometimes, hell… USUALLY… my camera does not bend to my creative will, and I get steaming piles of pixels such as you see above. Besides, even if I had captured that red ‘vette perfectly, my shadow would have ruined it! I won’t call it crap, per se, just a failed idea. I rather like the pic, and with PS you could add ‘movement’ to the ‘Vette’s arse! I’ve give it a 4 on the Wiggles Crap-O-Meter! I was on the other side of the car trying out some other shots from a low angle of the various rally cars going by and mine all came out like crap. The upside was that we got serenaded by coyotes….